Perennial herb from a taprooted, usually branched, woody stem-base; stems erect, 15-100 cm tall, smooth below, sparsely hairy and smooth above especially in inflorescence. Basal leaves 10-40 cm long (including long stalks), much shorter than stems, twice 3-parted, the first set of 3 stalks 16-95 mm long (the leaflets not crowded), smooth or long soft-hairy, each leaflet 14-68 mm long, 2- to 3-times shallowly to deeply lobed, thin, usually hairy and with a bloom beneath, not glandular; stem leaves few, shorter-stalked. 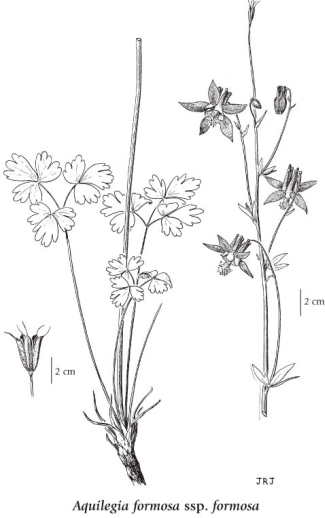 Inflorescence of several nodding to hanging flowers in a terminal cyme, the flowers 3-5 cm wide; bracts leaf-like but greatly reduced, unstalked; petals 5, distinct, the spurs red, knobbed, 13-21 mm long, stout, abruptly narrowed near middle, with straight tips, not curved in, the blades yellow, oblong, sometimes absent, to 6 mm long, 4-6 mm wide; sepals 5, pale to deep red, widely spreading, elliptic to lance-shaped, 10-26 mm long, 4-9 mm wide, tips pointed to sharp-pointed; stamens 12-17 mm long. Follicles, 5, erect, egg-shaped, 15-25 (29) mm long, hairy; beaks 9-12 mm long; seeds black, egg-shaped, wrinkled and pebbled. Mesic to moist meadows, rocky slopes, thickets, clearings, roadsides and open forests in all zones except the alpine; common throughout BC; N to SW AK and S YT, E to SW AB and S to UT and CA. A shade-tolerant/intolerant, montane to subalpine, Western North American forb dis­tributed equally in the Pacific and Cordilleran regions. Occurs on fresh to very moist, nitrogen-rich soils within subalpine boreal, temperate, and cool mesothermal climates; its occurrence decreases with increasing elevation. Scattered in broad-leaved forests on flooded sites, often inhabits exposed mineral soils in early-seral communities on water-receiving sites. A nitrophytic species characteristic of Moder and Mull humus forms.